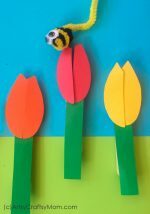 Few things describe spring as perfectly as this Spring Flowers in a Watering Can Paper Craft! 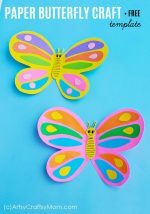 This paper craft is perfect for a DIY card or as wall decor. 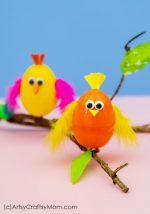 With the weather getting warmer, it’s only natural that we’re all in the mood for bright spring crafts. And everything spring themed are also things that kids love – flowers, birds, baby animals and rainbows! We’re in the mood for spring crafts too, and we’ve got a cute little flower project today – Spring Flowers in a Watering Can Paper Craft! 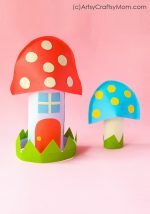 This is a craft that kids of all ages will love, and even toddlers can have a go in assembling the pieces with the help of an older sibling. 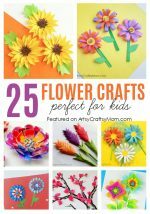 If you ask me, my favorite part of this craft are the rolled flowers and the watering can. It’s a welcome change from flower vases or baskets, and I’m sure to be hanging my watering can on the wall for some spring-themed decor! 1. Select different colored craft papers and trace the template patterns on them. Trace the watering can and the semi circular pattern on cardstock paper and the rest of the patterns on craft paper. Cut out the traced patterns. 2. 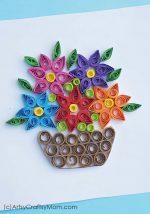 Roll the spiral patterns to create rolled flowers. Grab 1 big flower cut out and one small flower cut out. Glue the small flower on the top of the big one. 3. Glue the rolled flowers on the center of the attached flower cut outs. Next, fold the leaf cut outs into half lengthwise and then unfold, to create a crease along that line. 4. Take the watering can cut out and the semi circular cut out. Glue the semi circular cut out on the back of the cardstock watering can, along the top end. One by one attach the paper flowers on the semi circular part of the watering can. 5. Now attach the leaf cut outs between the flowers. Try to fill the semi circular part of the watering can with the paper flowers and leaves. Once you are done decorating, allow the glue to dry. As you can see, I’ve outlined the watering can to give it some definition, and make it stand out against the background. If this has triggered a craving for making more flower crafts, do check out our red felt poppies, newspaper hyacinths and egg carton daffodils. Seriously, you can make flowers out of anything!